This event is organized by Myanmar Chess Federation under the auspices of the Myanmar National Olympic Council. Entry fee is non-refundable. Entry Fees are waived for GMs, WGMs, IMs and WIMs. There will be a discount of 25% of entry fees for those who register on or before 30th September, 2014. Registration form shall be completed and sent back to the organizer by email via mgmglwin25@gmail.com by 15th October, 2014. IMPORTANT NOTICE: FIDE regulations do not allow us to accept any entries without an official FIDE ID number. The rating of this tournament depends on this rule and any player who wishes to participate must obtain his/her FIDE ID from their own federations. Souvenirs are to be distributed free for the participants by the organizer. Central Hotel, Bogyoke Aung San Road, Yangon. 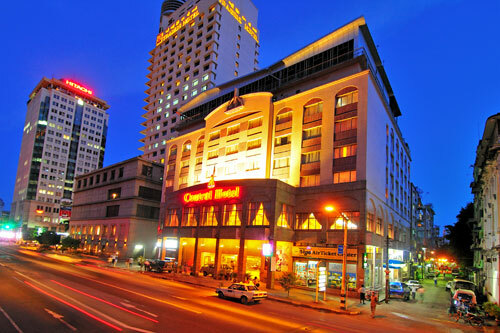 The hotel is located in the center of Yangon. There are many places of interest such as the landmark of Myanmar; Shwedagon Pagoda, Sule Pagoda, Bogyoke Aung San Market, Central Railway Station, Yangon Port, National Museum within the walking distance. More information can be found at www.myanmar.com. Reservation can be made directly to the hotel by fax or email. Myanmar Chess Federation members shall pay their dues upon registration. Foreign players shall settle payment upon the arrival. This is necessary to have the entry visa before entering Myanmar. The players from foreign countries have to apply and get the entry visa from the nearest Myanmar Embassy in their countries. Information is available here. 11. The organizers have the right to reject any entry without giving reasons.